Perched on the southernmost point of Argentine Patagonia stands Ushuaia, the town at the end of the world. A stepping stone to the South Pole, Ushuaia is best suited to adventure seekers and nature lovers: whether you're exploring penguin colonies on nearby islands, hiking ancient glaciers or drinking a cool craft beer amongst Antarctic explorers fresh-off-the-boat, you will find yourself enchanted by her dramatic scenery, fascinating history and pure unspoilt air. Find out more by checking out our collection of the best places to stay in Ushuaia. At the port a sign reads: "end of the world, beginning of everything." The port is full of Antarctica-bound vessels and their crews, notable only by their colourful jackets, and in the quaint little bars tucked away in side streets, explorers fresh from their expeditions exchange stories of what they've seen and where they've been to eager-eyed tourists and locals alike, sipping Beagle beer - a local-produced favourite. The town itself is a maze of steep streets lined with a colourful assortment of jumbled houses, all in the shadow of the snowcrested Martial massif. This town at the end of the world started life as a penal colony: the prison was closed in 1947 and is now a fascinating museum, dedicated to detailing the maritime history of Ushaia, her history of colonisation and the communities that lived there prior to colonisation, like the Yamana, who occupied much of what is now the Parque Nacional Tierra del Fuego. By taking a guided tour of the park or by booking a cruise of the Beagle Channel, you can see the remnants of the Yamana communities: the archaeological ruins on Bridges Island is one such example. Nature abounds in Ushuaia. Whether you're taking a boat trip to spot dolphins, whales and sea-lions or cruising out to Isla Martillo to stand amongst the colonies of Magellanic and Gentoo penguins, you will find yourself lost in a different world. Be sure to take some time out to hike up to the Glacier Martial or explore the Laguna Esmerelda, a blue-green lagoon. If you're there during wintertime, don't forget to try your hand at skiing at the Cerro Castor Ski Resort, a family-ran resort just 16 miles north of town. Cruise the Beagle Channel and spot sea-lions, whales and dolphins! Head out to Bridges Island to explore the ruins of a Yamana settlement. Immerse yourself in local history at the former prison, the Maritime Museum. Take a guided tour through the Parque Nacional Tierra del Fuego and walk amongst lagoons, glaciers, waterfalls and peat bogs. Stroll amongst penguins at Isla Martillo! Hike up the Glacier Martial. Check out the Paseo de los Artesenos, a building hosting handcraft stalls and vendors selling woodwork, leather, textiles and paintings! Be sure to drink a Beagle beer - a local favourite - at one of the many bars. The town at the end of the world, Ushuaia boasts sublime natural scenery and a great many activities to feast-your-eyes upon, from whale-spotting to skiing. 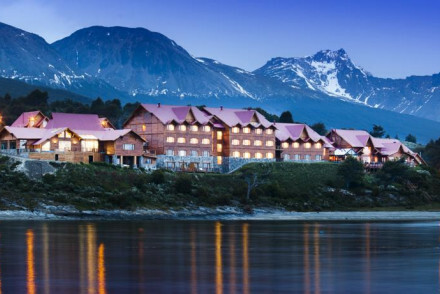 A strange and beautiful region, ideal for an adventure holiday, the best places to stay in Ushuaia will ensure your stay is divine. Los Cauquenes: with an outstanding location overlooking Beagle Bay, this luxury property offers lush contemporary rooms, an indulgent spa and sumptous restaurant. Ideal for couples looking for intimacy and romance, the lounge has a roaring fireplace and the views are simply to-die-for. Fly to Buenos Aires and get a direct flight to Ushuaia. Year round, Ushuaia is very windy and fairly cold. The best time to visit is between November and February, when the temperature ranges between 5 and 14 degrees. A luxury property in an outstanding location, overlooking the Beagle Channel. Smart rooms boast sink into beds, atmospheric domed pine clad ceilings and epic views from the large windows. Dine on exquisite regional dishes and partake in any number of the many outdoor activities. Heavenly. Back to Nature - Revel in the epic secenery of Argentina’s extreme southern end. Kayaking - Sail on tandem kayaks from the Tierra del Fuego National Park towards the hotel. Cooking classes - Discover the secrets of Fuegian cuisine.